The 4G63 engine is a member of the Mitsubishi Sirius 4G6 family firstly introduced in 1980. It is the four-cylinder 2.0-liter gasoline naturally aspirated engine (the turbocharged version is the 4G63T engine). The 4G63 is a heavily modified the G63B engine (a SOHC carbureted eight-valve version installed in different Mitsubishi models until 1986-88). This engine has a long history and it has been used in a wide range of applications (in Mitsubishi, Plymouth, Dodge, Eagle and Hyundai vehicles). There were many versions with new upgrades and different parts during the production. The 4G63 engine always has a cast iron cylinder block. The engine block is equipped with two balance shafts (silent shafts). It also had forged steel crankshaft and connecting rods and cast aluminum alloy pistons (some engines had aluminum pistons with steel inserts). Depends on modification, the engine has several types of aluminum cylinder heads: 8-valve SOHC head, 16-valve SOHC head, and 16-valve DOHC head. All versions use the timing belt to drive the intake and exhaust camshafts or just single camshaft. The single cam actuates the intake and exhaust valves via rocker arms and the adjustment of the valve clearances is required. The cylinder heads with double overhead camshafts offered since 1987. These engines also have rocker arms but with automatic hydraulic valve clearance compensation. The intake valve diameter is 33 mm; the exhaust valve diameter is 29 mm. The all 4G63 engines were equipped with Mitsubishi’s electronically controlled multi-point fuel injection system named as ECI-MULTI. The DOHC engines also got the electronic ignition. The engine has gained fame thanks to the turbo version 4G63T and numerous victories of Mitsubishi cars in rally competitions with this 2.0l turbo engine since 1988. Together with 2.0l version, the manufacturer produced the big brother – 2.4-liter 4G64 engine. The Mitsubishi has stopped the production of the 4G63 and replaced it with the new generation of the 2.0-liter engines – the 4B11 engine. But the 4G6 is still being installed by some Chinese automakers in new vehicles today. The hydraulic valve lifters are very sensitive to the fuel quality. Not replaced engine oil in time can easily reduce their longevity down to 30-40k miles. The jammed bearings of balance shafts can lead to serious engine damages. It’s highly recommended to keep oil system clean, use good quality engine oil, and check the condition of the belt. Some people prefer to eliminate balance shafts completely by installing a special aftermarket balance shaft eliminator kit. In general, the 4G63 is known as a very reliable engine. Most of them already have a huge mileage near 200,000-250,000 miles (300,000-400,000 km). But the engine is easy for rebuild and repair because the OEM and high-performance parts are available and easy to buy. 4G631 - 133 hp at 6,000 rpm, 130 ft lb (176 Nm) at 4,750 rpm. This is a 16-valve SOHC engine with compression ratio 10:1. You can find one of these in Mitsubishi Galant E33, Space Wagon/Chariot/Nimbus. 4G632 - a little bit more powerful 137 hp version. It has the same specs as the 4G631 engine. Application: Mitsubishi Galant E55. 4G633 - 109 hp at 5,500 rpm, 117 ft lb (159 Nm) at 4,500 rpm. 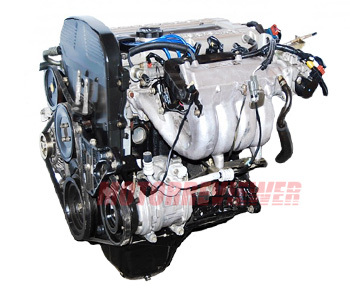 The engine has 8-valve cylinder head with single overhead camshaft and low compression ratio 9:1. Application: Mitsubishi Galant E33, Space Wagon. 4G635 - 144 hp at 6,500 rpm, 125 ft lb (170 Nm) at 5,000 rpm. This is a DOHC 16-valve engine; compression ratio is 9.8:1. Application: Mitsubishi Galant E33, Eclipse. 4G636 - 133 hp at 6,000 rpm, 130 ft lb (176 Nm) at 4,750 rpm. This is also a 16-valve engine but with SOHC head; compression ratio is 10:1. Application: Mitsubishi Galant E33/ЕА2А, Chariot/Space Wagon/Nimbus, RVR/Space Runner. 4G637 - 135 hp at 5,750 rpm, 130 ft lb (176 Nm) at 4,500 rpm, DOHC head, 16 valves, compression ratio is 10.5:1.